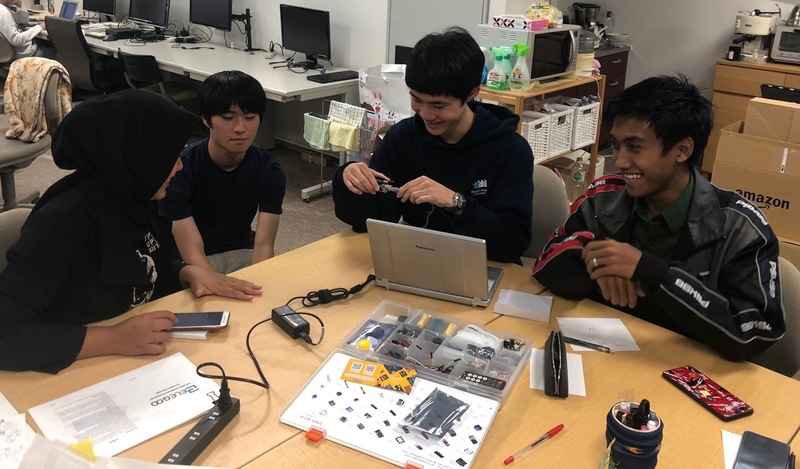 (1)Topic for 2nd-year students: "Brainstorming for applications of Artificial Intelligence"
(2)Topic for 1st-year students: "Experiencing and Learning Arduino"
Fig.2. 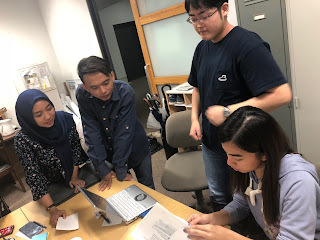 Brainstorming for "what is AI?" 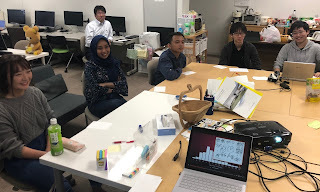 Three 2nd-year students from ICT-specialized course, four PENS students, one master course students from Takano laboratory, and Professor Miyzaki joined this seminar. The main purpose of this seminar is to be friends each other through the session! Fig.3: Brainstorming for "what is potential application for AI?" 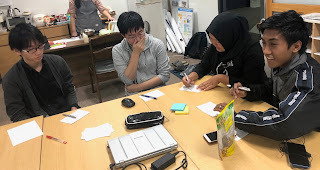 First, we studied two communication methods for introducing idea using "visual information" and deriving promising idea by group discussion called "brainstorming". 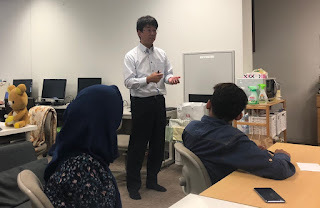 After that, they learned about overview of "deep learning" that is one of modern technologies of artificial intelligence. In the session, they started from (A) self introduction, and conducted brainstorming regarding (B) "what is AI?" and (C) "what information service can be realized, if recognition ability of computer software is close to human? ", and explained their answers by illustration. In the afternoon at the same day, four 1st-year students from ICT-specialized course and four PENS students joined this seminar. The purpose of this seminar is to deepen their friendship as well! 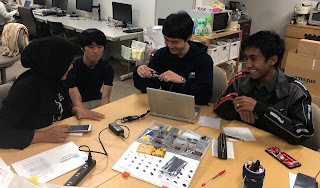 In the seminar, students experienced electrical device programming by learning an electrical kit called 'Aruduino'. In both seminars, students spontaneously deepened their friendships and could be friend each other! Thanks to student's positive attitude, we could spend really meaningful and fun time. 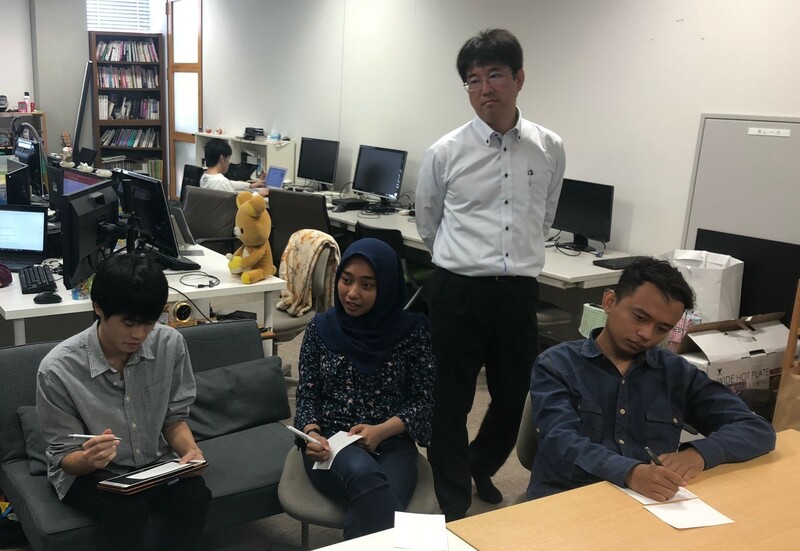 If we have the next opportunity like this, I am happy to plan this kind of an international collaborative seminar.